If you have a thyroid condition, it’s no secret that exercise and a healthy diet can help manage your symptoms and improve your overall health. But if you have an undiagnosed thyroid condition that is not being properly controlled, there are risks — even to “natural” supplements and exercise. That’s why it’s so important to talk to your doctor about symptoms like fatigue, weight gain or loss, and trouble sleeping. These common symptoms can have many causes, including a thyroid disorder. Exercising with either uncontrolled hyperthyroidism (overactive thyroid) or hypothyroidism (underactive thyroid) can be dangerous to your health as these conditions increase or depress people’s metabolism, respectively — speeding up or slowing down their heart rate. For people with significant hyperthyroidism (commonly caused by the autoimmune disorder Graves’ disease), exercise can “overheat” the body in a dangerous way. Patients with significant hypothyroidism (commonly caused by the autoimmune disorder Hashimoto’s disease) should also be cautious. Underactive thyroid causes the heart rate to slow, so a sudden return to exercise can be like a jolt to the heart. “I advise my patients with hypothyroidism not to exercise for a few weeks until their condition is well-controlled with medications,” says Dr. Nasr. Once a person with a thyroid disorder returns to normal thyroid function with the use of medications, says Dr. Nasr, a return to exercise is safe and can help improve remaining symptoms. People with hypothyroidism, for example, often experience fatigue and weight gain that doesn’t always abate with the use of thyroid medications. Exercise can help boost energy levels and control weight. Iodine deficiency is a leading cause of hypothyroidism worldwide, but the typical U.S. diet contains plenty of it, says Dr. Nasr. Americans should avoid iodine supplements or daily servings of high-iodine foods like kelp to keep their thyroid in balance. Soy can be a healthy addition to anyone’s diet, “but the question is how much,” says Dr. Nasr. “When you eat a lot of it on a daily basis, it can precipitate hypothyroidism in a person with Hashimoto’s disease.” It may also affect the absorption of thyroid hormone. Selenium is a trace element that limited studies have connected to reducing the inflammation found in those with Hashimoto’s disease and may possibly delay progression into hypothyroidism. Dr. Nasr tells such patients they could try 200 micrograms once or twice a day which can be done naturally by consuming 3-5 Brazil nuts. 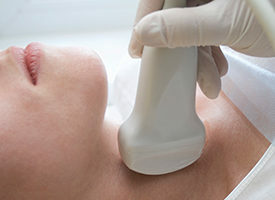 When it comes to thyroid conditions, including symptoms and dietary questions, it’s critical to keep your doctor informed and vital to your health.